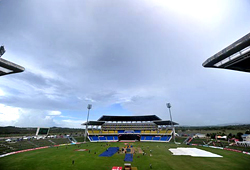 Sir Vivian Richards Stadium was built for use in the 2007 Cricket World Cup where it hosted Super 8 matches. The stadium usually caters for 10,000 people, but temporary seating 20000 for the 2007 Cricket World Cup. The stadium is named after former West Indies cricket team captain Viv Richards.